Thorough planning, plus the right attitude, can lead to you having a great time while minimizing waits, and saving money while theme park adventuring this summer! We took a trip to Universal Studios to give you our plotting and planning success story! Before you get there, be familiar with the park layout, its rides and attractions, when the shows and parades start, and what time the park opens (you should arrive before the designated time so you can accomplish plenty of things in the first couple of hours before the hordes arrive). We got there 30 minutes early and took advantage of Universal’s City Walk which is only a short distance from the park itself. With a newly opened VooDoo Donuts calling our name this was our first destination. We ordered two lattes of our choosing and decided to split three donuts to caffeinate and sugar us up for the day ahead. Pro-Tip bring as little as possible to get through security faster, and always pack a sweater for later. We kicked off our Universal Adventure at Harry Potter. You’ll want to get there right when it opens as Potter remains a huge draw, and even with fast passes (which we can’t rave about enough) it’s busy. So, be there early, ride all the rides…we suggest starting at the castle. Once you’ve hit up all the attractions it’s your best bet to go inside the Three Broomsticks and grab a frozen ButterBeer. It stays colder at the inside bar, and the Pumpkin Juice is nothing to bat an eyelash at either. But our favorite Butter Beer is defiantly frozen and most certainly from the inside bar. It’s colder because the frozen ones outside are well…in the socal sun and despite all their best efforts its just not as cold plus the lines are generally shorter inside. While doing your research, you’ll notice that many park websites offer advice on the best time and day to visit. In general, weekdays are often the least crowded, while Saturdays are often the busiest. However, some members of ThemeParkInsider.com actually recommend weekends during the summer months for Orlando-area parks. So if you’re thinking of hitting up Universal Orlando….possibly re-arrange your schedule for the lesser of busy days. 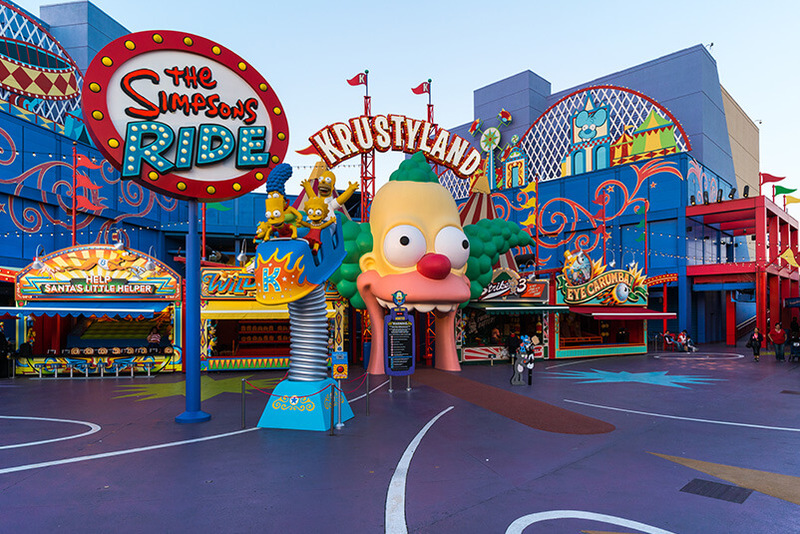 We recommend Tuesdays or Wednesdays at Universal Hollywood. Considering that most park tickets cost $50 or more per person, you want to get your money’s worth when you get there, which for most people means spending the entire day at the park. But things can go awry quickly if you don’t plan accordingly. To beat the heat, wear light-colored clothing, sunglasses and a hat, and bring along a washcloth in a plastic bag that you can soak in water throughout the day for instant relief. If rain is in the forecast, buy some dollar-store ponchos that you won’t mind tossing once afternoon showers pass. Whatever the forecast, remember to bring sunscreen (it’ll cost you a small fortune inside the park) and reapply often—nothing ruins an afternoon quicker than a youngster suffering from sunburn. Lastly, wear comfy, broken-in shoes. We wore our Toms and applied Coola Sunscreen every 2 hours which we set a reminder for. No sunburn, and our feet felt great. We walked a total of 22k steps that day, phew talk about a workout. Before you leave your car, take a photo of the parking lot aisle number or sign (“Jurassic” can be really hard to remember 16 hours later). Also take photos of young children, so you’ll have accurate information to give security officials if someone gets lost. (We’d leash them…but thats us). Once you get inside the park, it’s easy to get overwhelmed by all the sights and sounds, and end up just following the herd from one attraction to the next. For a more strategic approach, don’t dawdle at the front of the park, where most visitors slow down and get on the nearest ride; instead, head to the back of the park, which will be nearly empty if you’ve arrived early in the day. If coasters and rides are your passion, get on those rides first so you can check them off your must-do list. And don’t bother with shopping or static attractions first thing in the day—both will be much easier to visit later on, when everyone else is in line for the big-name attractions. If everything works out, by noon you’ll have already been at the park for two or three hours, so take a break and have a leisurely sit-down lunch or go back to your hotel for a nap or a swim. The idea is to get off your feet and recharge your batteries so you can return to the park a few hours later feeling refreshed and eager to enjoy the afternoon and evening, when other visitors are starting to wear down. Another option is to have an early lunch or dinner and ride the popular rides when everyone else is breaking to eat at more traditional times of the day. Or be a champion and stay ALL day like we did. The key is to give yourself sitting breaks. We’ll have a complete list of our plan of attack at the bottom. EXPRESS PLUS PASSES. You have been doing it ALL WRONG until you tackle the park with an Express Pass. You will never blink an eye at the extra monetary amount ever again. EVER. It is the best money you can possibly spend. Park in Jurassic. The lot name is awesome and you won’t have a hard time finding it. Get there at LEAST 30 minutes before the park opens, have coffee and breakfast or a snack at City Walk before heading to the security line. The VIP Backlot Tram ride ( After all the walking it’s nice to sit), plus you’ll learn some really cool history about Universal and the tram even features 3D experiences. Kiddie-land after the Walking dead you need as many happy and bubbly Minions in your life as possible. 20. 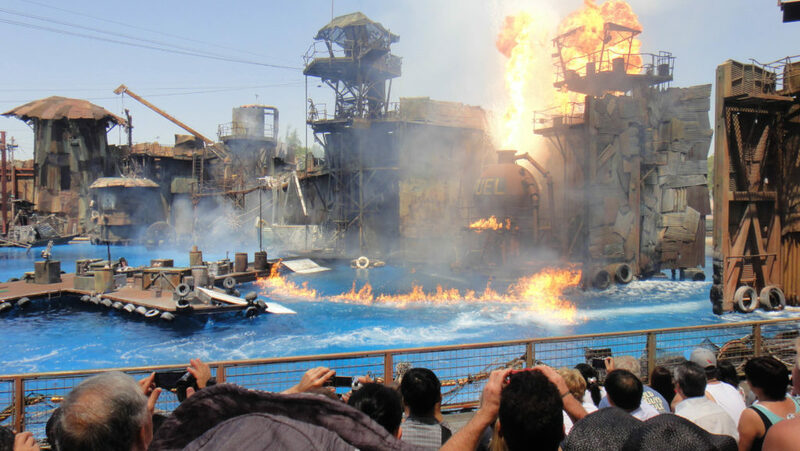 WaterWorld it’s seriously such an incredible stunt show! Universal has working Stunt Men and Women from film and TV who perform the show and it really is spectacular. This is also really interactive and fun, which gets your energy up for the remaining time you have before the park closes. 21. Snack – We grabbed a quick slice of pizza upstairs across from the Harry Potter area. They have a nice little selection of quick food options. 22.The Special Effects show. If you’ve ever wanted to see how special effects are done, this is the show for you. 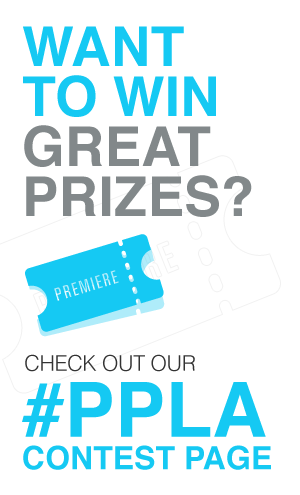 It’s really cool and even involves audience participation. 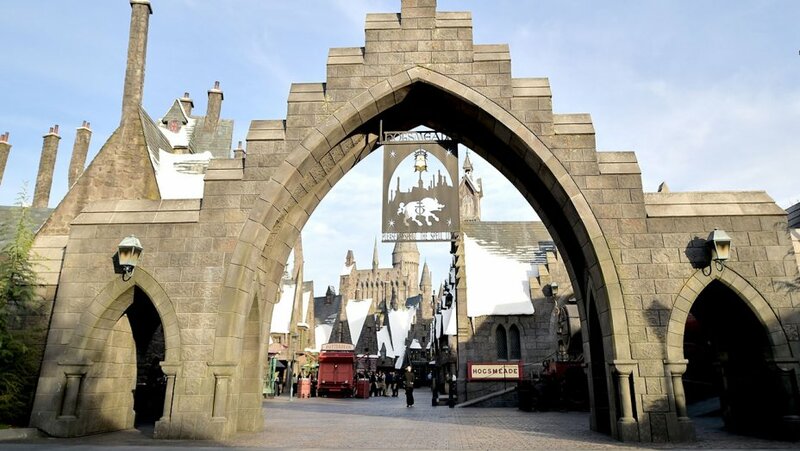 23.Harry Potter – If you plan your trip right you can catch one last adventure in Hogsmeade. 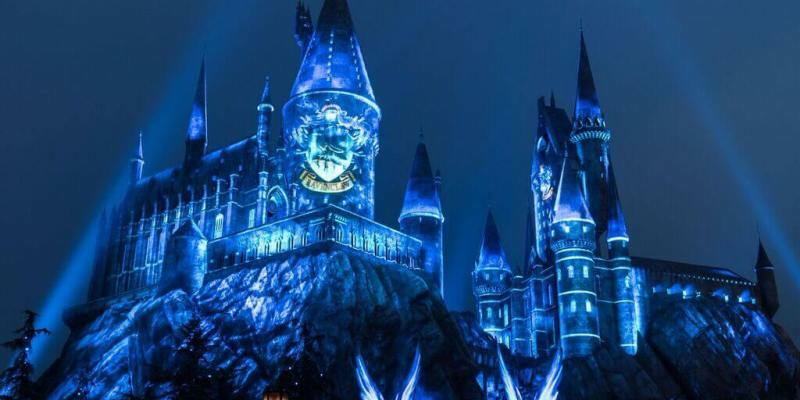 During the summer Hogwarts is home to a very impressive lights and music show against the castle which is not one you’ll want to miss. 24.This is the perfect time to head to City Walk. You can grab margaritas at Margaritaville, or eat from an array of their restaurant choices. If you really need a souvenir this is also a great spot for shopping. And thats all folks!